Here's the Reuters report of the mistrial, with my comments. An Ohio judge declared a mistrial on Saturday, finding jurors hopelessly deadlocked in the case of a white former University of Cincinnati police officer charged with murder in the shooting death of a black motorist during a traffic stop last year. The panel of six white men, four white women and two black women began deliberating on Wednesday at the Common Pleas Court in Hamilton County on whether former officer Ray Tensing was guilty of murder or voluntary manslaughter in the fatal shooting of Samuel DuBose. Prosecutors have until Nov. 28 to decide whether there will be a retrial. Cincinnati Mayor John Cranley said he hoped that would happen. The 12 jurors had told Judge Megan Shanahan on Friday that they had failed to reach a unanimous verdict, but she ordered them to redouble their efforts. She declared a mistrial after hearing how, despite "a night of sleep and two additional hours of deliberations," the panel had still failed to agree. Tensing, who had pleaded not guilty and was free on $1 million bond, drank from a water bottle and stared straight ahead as Shanahan spoke. None of DuBose's relatives were present in the courtroom. Tensing was fired from the University of Cincinnati Police Department after being indicted in July 2015. Decoding media operative Ginny McCabe’s race-speak: She supports the murderous war on white cops. Hamilton County prosecutor Joe Deters said the jury had been leaning toward acquitting Tensing of murder and convicting him on the lesser charge of voluntary manslaughter, but that they could not agree. "I still think it's murder and I think we proved it," Deters told reporters at the court. Hundreds of demonstrators later held a peaceful rally in the city's Washington Park to protest both the mistrial and the election of Donald Trump as president - one of several such rallies held in big U.S. cities on Saturday. Cranley, Cincinnati's mayor, told a news conference he believes DuBose did not deserve to die. "I believe a just outcome would lead to accountability for that fact," Cranley said. "We've learned throughout this process how deeply Prosecutor Deters feels about this case... so I suspect he will continue to find a way to bring justice." Mayor Cranley’s statement may be grounds for a change of venue for the re-trial, since he has poisoned the jury pool. Cranley said city officials respect people's right to be upset, and that he believes protests will continue to be peaceful. He said downtown remains safe and open for business. 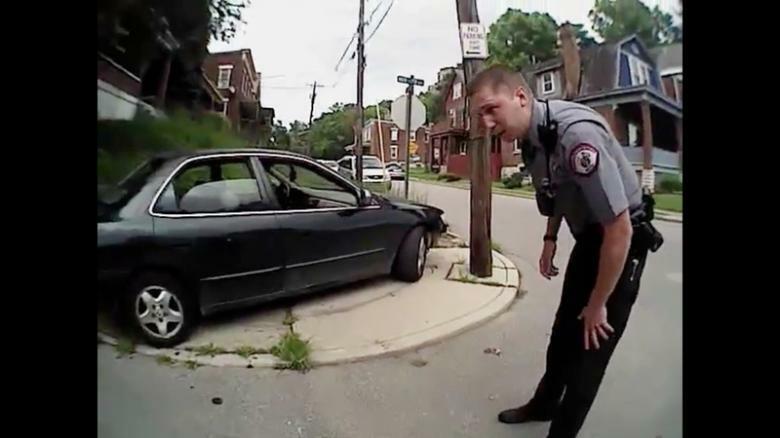 Body-camera video of the July 2015 incident showed Tensing, 26, shooting DuBose, 43, in the head after pulling him over for a missing front license plate on his vehicle. During the traffic stop, which occurred near the southeast edge of the University of Cincinnati's main campus, Tensing asked DuBose to remove his seatbelt and tried to open the car door. DuBose did not comply and closed the door. The vehicle started rolling forward slowly as Tensing pulled his gun and fired once. The Reuters “reporters” and “editors” failed to note that one of Officer Tensing’s arms was inside the door window, as DuBose sought to flee in his car. A trifling matter, to be sure. The defense maintained that Tensing feared for his life and only opened fire in an attempt to prevent being run over by DuBose's car or pinned to a nearby guard rail. In emotional testimony on Tuesday, Tensing told the court he had no intention of killing DuBose when he opened fire. The defense [sic] countered by arguing that Tensing was never in danger and had falsified his account by exaggerating that he was being dragged by DuBose's vehicle. Another trifling matter: Surely, it was the prosecution that so countered. What a freak mistake, that the operatives who wrote this would make it sound as if Officer Tensing’s own counsel had condemned him!